Josh Warrington is craving a world featherweight title unification bout later this year but knows he cannot underestimate the threat of Kid Galahad. Warrington has firmly established himself as one of Britain's leading lights in the past 12 months, wresting the IBF crown from Lee Selby last May before successfully defending the belt against Carl Frampton in December. On both occasions, Warrington was a firm underdog with bookmakers but he will be the favourite when he steps into the ring against fellow Yorkshireman and mandatory challenger Galahad on June 15 at the Leeds Arena. Warrington, though, insists the tag will not alter his mindset, especially as he is eyeing a showdown with either WBO titlist Oscar Valdez, WBA champion Leo Santa Cruz or WBC beltholder Gary Russell Jr later in 2019. The Leeds fighter said: "He's the next fighter in line, I don't have much respect for him, to be honest, that's genuine. But I've got to deal with him. "I don't know how he's made himself mandatory but he's mandatory, I've just got to deal with it. "If I could have it my own way, I'd fight one of the other world champions. I want to go Stateside and unify the division, I want to make memories but I've got to deal with him and that's it. It's as simple as that. "People might say 'this is an easy fight for Josh'. I take any fight as an easy fight, I've prepared for them like it's Mike Tyson every time. You've got to do that, you've got to have that mindset, you've got to have that hunger. "I've got to prove why I'm at this level. Twelve months ago I was just a run of the mill fighter, all of a sudden I'm one of the country's leading fighters who's in his prime." The fight against Galahad was expected to take place on May 4 but has been delayed by six weeks because of an injury to Warrington's right hand - a consequence of his win over Frampton. Warrington added: "It's getting there. It was in absolute agony after the Carl fight, I couldn't really move it until around six weeks after. "I've just had to rest it as much as possible. It was either that or go down the road of an operation and I didn't want to do that and have a lot of time out. "I've had to extend the fight a little longer. I want to go into this fight 100 per cent, I can't be going into this fight giving any percentages away because I'm champion - why should I give any advantages away?" 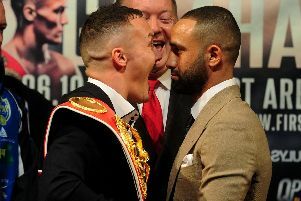 At an open press conference in Leeds to announce the fight, Galahad was taunted on a number of occasions by the crowd because of a two-year ban, later cut by six months, he served for failing a drug test in 2014. 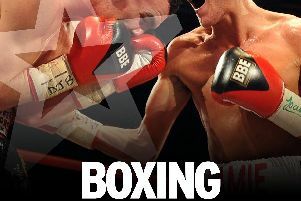 Warrington added: "He's been given that green light to box so what can I do? I've just got to fight him. "If anything that's more of a motivation to beat him. We can't let drug cheats win world titles, can we?" Galahad - who, like Warrington, is unbeaten in his professional career - was uninterested in dwelling on the suspension. He told Press Association Sport: "It's in the past now. Everyone keeps going on about it but it is what it is. "I'm here now, I'm fighting Josh Warrington on June 15 and that's what I'm looking forward to. "He's in a position that he doesn't want to be in. He's taken a fight he doesn't want to take. He doesn't want to fight me, if he could vacate and go somewhere else, he would but he can't. I can't wait now."